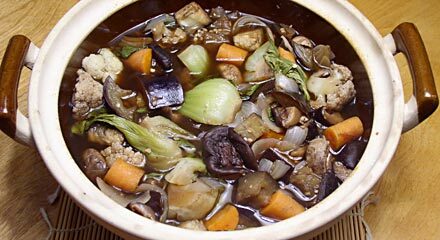 This recipe uses a traditional Chinese clay pot to bake the vegetables in the oven, but you can use any covered casserole dish. If using a casserole dish, there’s no need to set it in water–just put it directly into the oven. Some clay pot manufacturers recommend slowly heating the pot, rather than placing it into a heated oven in a pan of water. Follow the directions for your particular pot, heating it up to 400°F. The sweet, warm, cool, and spicy blend of seasonings in this recipe makes ordinary vegetables come alive with flavor! Soak a Chinese clay pot in water for an hour before using. Alternatively, use a casserole dish. Preheat oven to 400°F (200°C). (Or use the directions that came with your clay pot for gradual heating.) Mix all the ingredients together and place in the cooking container. Put the pot in a large baking dish filled with enough water to reach halfway up the pot. Bake for 1 hour, Serve from the claypot at the table. Accompany with steamed rice. Tip: Always set the hot clay pot on a cloth pad or towel rather than a cold surface when it first comes out of the oven or the sudden change in temperature may crack the pot. Note: I think it’d be easy to do this in a crock pot, 4-6 hours on high or 8-10 hours on low.